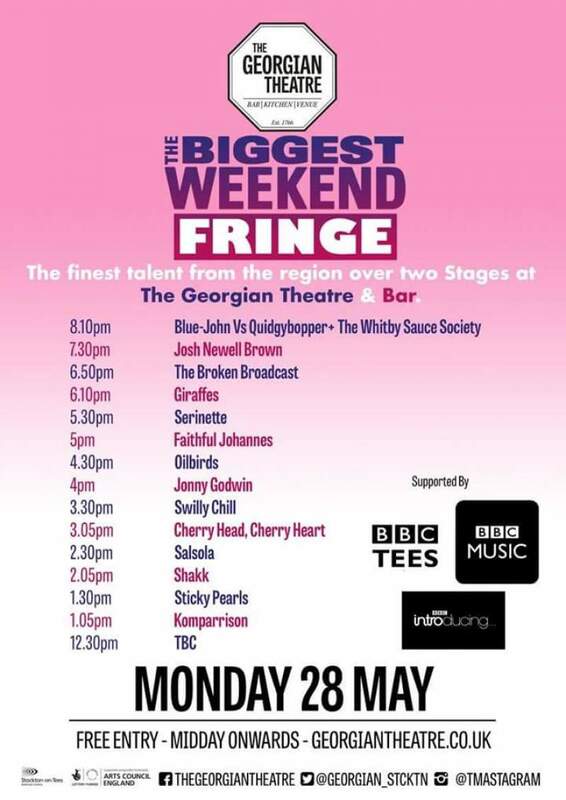 With an upcoming Bank Holiday weekend to look forward to, this Monday 28th May sees BBC Tees Introducing bringing some of the best in Teesside music to the Georgian Theatre in Stockton. As part of The Biggest Weekend Fringe it’s a day packed with incredible musical talent featuring Blue-John Vs Quidgybopper, Josh Newell-Brown, The Broken Broadcast, Giraffes, Serinette, Faithful Johannes, Oilbirds, Jonny Godwin, Swilly Chill, Cherry Head, Cherry Heart, Salsola, Shakk, Sticky Pearls, and Komparrison. It’s an incredibly easy way to immerse yourself in some of the best in Teesside music and best of all, it’s totally free. Running from midday, you might wanna rest up over the weekend so you have the energy to soak it all in. Teesside BBC Introducing is at Georgian Theatre, Stockton on Monday 28th May.